We live on the far east side of the Columbus, Ohio, suburbs--but, our middle daughter's best friend moved about 40 minutes away to a further east and more rural part of Fairfield County, to Pleasantville. Had that move not happened--we probably would not have discovered a small, family owned restaurant: Pacer's Italian Cuisine & Steakery in downtown Pleasantville. I love finding these small, local, family-owned places--so Pacer's was immediately on our "dinner-to-do-list"! 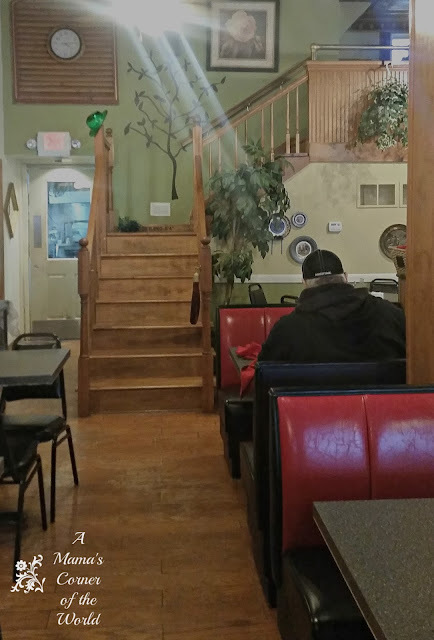 We recently had a nice dining experience at Pacer's and wanted to share it--just in case you want to make the trip from wherever you are in Central Ohio. What did we think of Pacer's Italian Cuisine & Steakery in Pleasantville, Ohio? 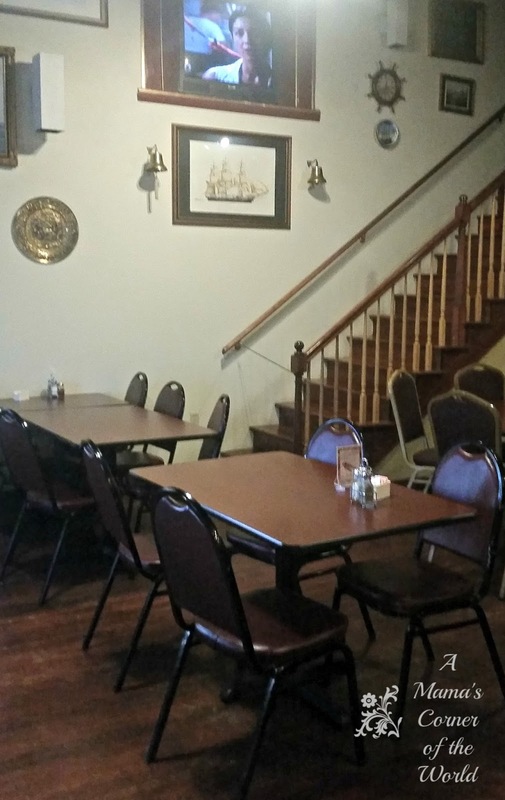 I love finding family owned restaurants taking up fairly "new" space in old, small town, "historic", buildings. This building has a lot of small town charm. The owners have opted to decorate with what many will see as collectibles--my grandmother's home held so many of these items from the 50's on--and the building itself is just a really great "step back in time" outing. This area is sort of the "bar" zone--but, I thought it was pretty ironic that Law & Order SVU was on the t.v. (I may or may not have a Law and Order addiction!) 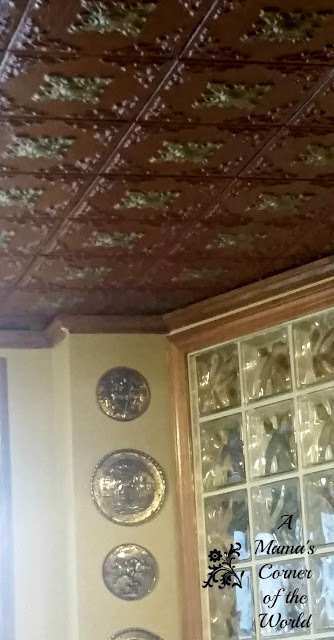 so I had to take a quick photo--and the gold plate on the wall is the twin to one that my step-grandmother had for years and years! I love textured/tiled/plated ceilings--so it was fun to see this and more of my Grandma Lou's "plates" on the wall! A couple replicas sit in front of my fireplace at home today as I write. Where should you park? We drove around the block a couple of times. Was there a parking lot? Did it matter? Visitors should expect to park on the street around the building's "block"--and, if Pacer's is busy, that may mean parking by a residential property or by the local school or near the police department building. Diners will be met with a small--but, very friendly, staff. During our Saturday night dinner visit, the entire restaurant was served by one server. She stayed busy, was super friendly, was extremely knowledgeable about the menu--and was more than willing to share specials, events, and keep everyone up to date on Pacer's happenings. (We learned that the restaurant was catering a fundraiser at a local high school that night--and the staff had been cooking ALL DAY to feed that event--and I love to support local restaurants that play such an active community role.) We also learned that most everything on the menu is made on-site--and we felt more than welcomed during our entire visit. How was the food at Pacer's? Okay. This is why we venture out to any restaurant, right? Local or not! It arrived with Onion straws, Jalapeno Poppers, Wings and Cheese Crostini's. 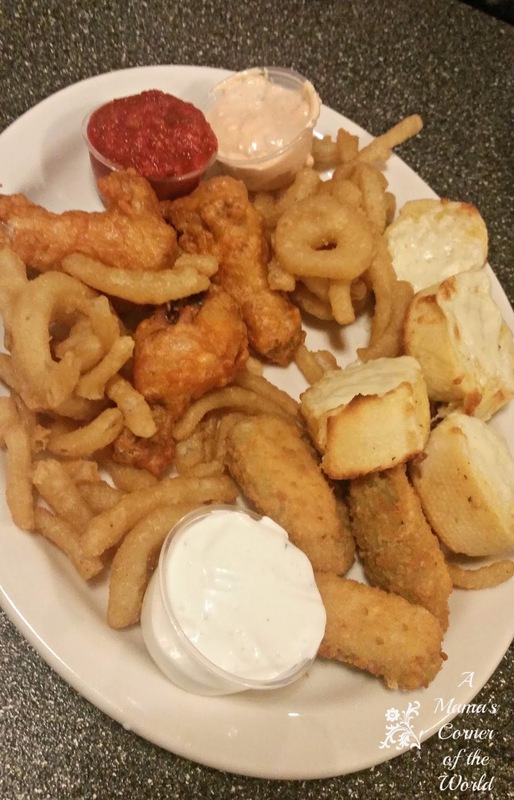 The onion straws were a little thin and greasy--but, the jalapeno poppers were a hit. The wings were really very good--not too spicy--and well prepared. The Cheese Crostini was essentially thick cut, garlic cheese bread slices--but, it was also served fresh and well. We had heard that the portion sizes were huge at Pacer's--so we weighed our dinner options. For dinner...We opted to split the Lasagna and the Chicken Parmigiana between my husband, our youngest daughter and myself--with the addition of an extra house salad for our daughter since both of the meals came with an included salad and a table bread stick basket. 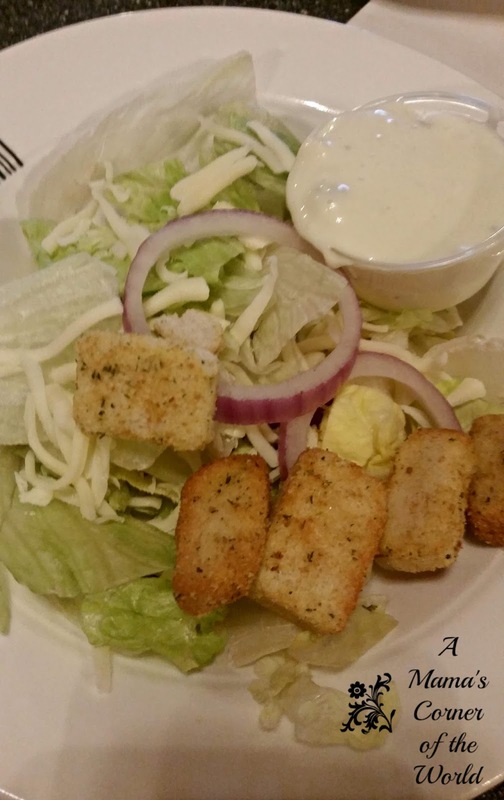 The house salad was pretty basic--lettuce, a little cheese, croutons, and some red onion--but, the ingredients were really fresh and the salad dressings were well chilled and full of flavor. We had heard that everything was made onsite. That wasn't really entirely the case. 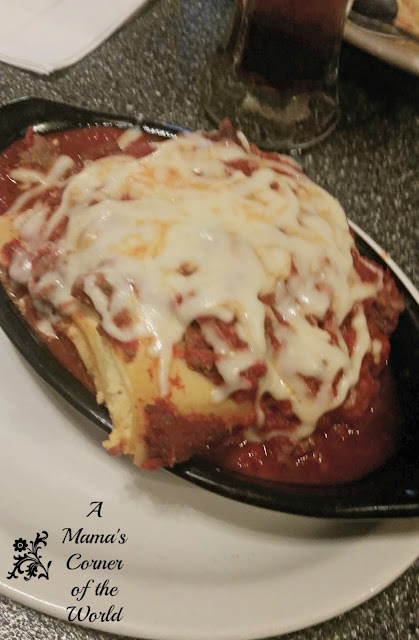 After ordering, we learned that the lasagna is one of only a few menu items not made fresh onsite. While this dish was processed and prepped--it was actually quite good. And the portion size was more than large enough for the price. The Chicken Parmigiana is hand breaded and prepped onsite, and offered in a fairly large portion with marinara and spaghetti--and it was a big hit with the husband and youngest daughter alike. 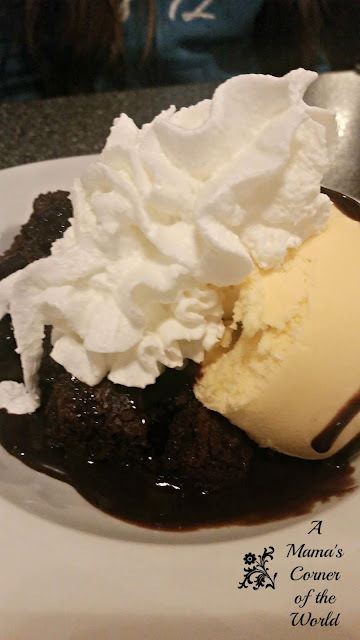 The brownie itself was a little burnt around the edges--but, the dessert was huge and loaded with ice cream and whipped cream. I was already stuffed from my "share" of the entrees and the sampler platter--and I am not really a lactose loaded dessert lover...so the husband and the youngest daughter found space for most of this dessert! 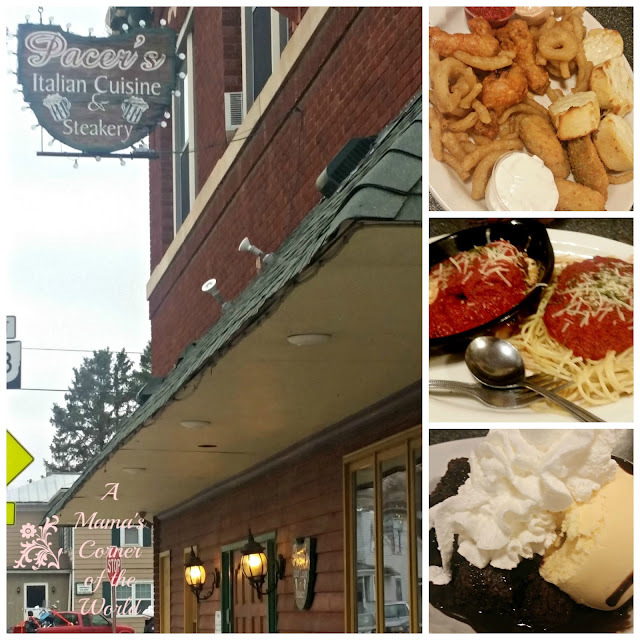 Would I recommend Pacer's Italian Cuisine and Steakery in Pleasantville, Ohio? 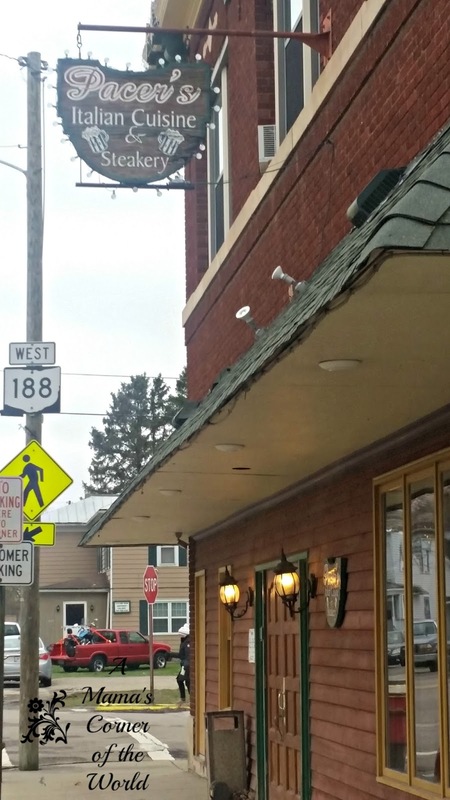 My family liked the small town feel and attention given to our meal experience during our visit. 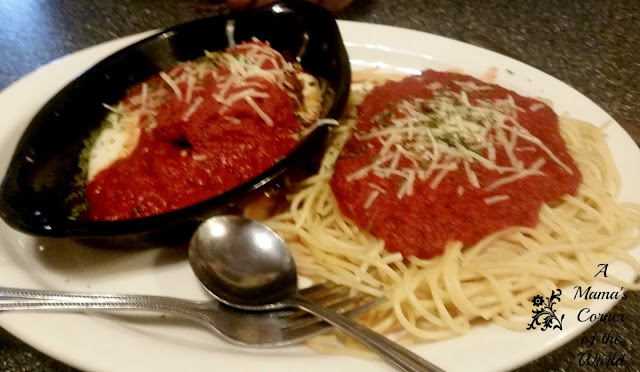 We did not experience any of the "steakery" side of menu--but, the Italian cuisine was certainly well portioned and well served for the price and location. The restaurant offers a local "punch card" that gives return diners a $$ amount off a future meal after so many visits--and the restaurant offers really nice daily specials as well. If you live in or near Pleasantville--you really need to visit Pacer's. They have great prices for the portions served--and they offer pizza and catering and do a great job in supporting the local schools and community. Check Pacer's hours--because they are not open all day--the have a "break" period where they close between lunch and dinner. They do recommend reservations for weekend dinner hours. They offer a full bar, children's menu and a very large dinner menu. It's basic, simple, food--nothing super fancy--but, it was well worth our visit and we will likely return. Another table ordered pizza during our visit and it actually looked quite good. I do see us ordering a pizza on an upcoming visit on the way home from a cross country or track meet.